Artemis·Greenberg Van Doren·Gallery is pleased to present an exhibition of 13 new collages and an installation by Los Angeles artist Alexis Smith. The exhibition, titled LUST/RUST/DUST, is on view from March 25 through April 24, 2004. This will be the artist’s second exhibition with the gallery. 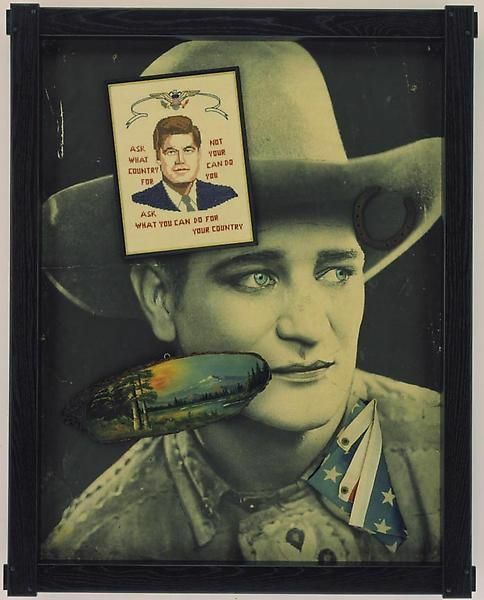 Smith’s work was recently included in the exhibition Some Assemblage Required: Collage in Post War America, organized by the Everson Museum of Art and Beau Monde, organized by David Hickey for Site Santa Fe. In the 30-year period since the artist chose the name of the actress Alexis Smith to replace her given name, she has worked in collage, painted wall installation (a form that she pioneered in the early 1980’s) and mixed media sculpture. Smith’s work has been the subject of over fifty solo shows in museums and galleries, including the Museum of Contemporary Art, LA; the Walker Art Center, Minneapolis; the Miami Art Museum, Miami; and a highly praised mid-career retrospective at The Whitney Museum of American Art. Since the early 1970’s, Alexis Smith has created mixed media collages using found imagery and objects to explore American mythology and social concerns. Using the medium she has perfected, Smith challenges herself and the viewer to be brave and to speak up. In this new body of work Smith responds to the current political climate by confronting public perceptions of good and evil in a post 9/11 world. The centerpiece of the exhibition is a wall installation that subverts Robert Indiana’s famous LOVE symbol from the 1960's, which Smith has transformed into the much less optimistic LUST/RUST/DUST. The stimuli may be new, but the themes are classic. Working with historical images and text from Norman Rockwell to Dr. Strangelove, Smith, as the artist, places herself in a dangerous realm between political critique and propaganda. Using an abundance of found patriotic imagery, she emphasizes its current ubiquity and offers viewers an opportunity to formulate their own conclusion about not only America’s place in the world, but also the artist’s place in the work.